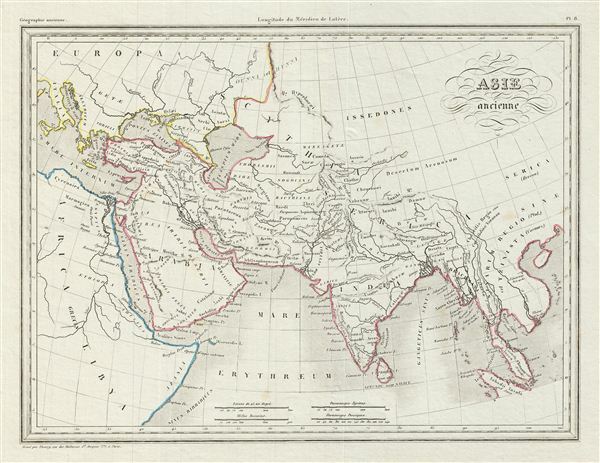 This is a fine example of Conrad Malte-Brun's 1843 map of Asia in antiquity. It shows the continent only as far as modern day Vietnam and does not include China or Mongolia. The Caspian Sea is notably malformed and suggestive of a general lack of knowledge regarding central Asia in europe. Various cities, towns, rivers, islands and other topographical details are marked, with relief shown by hachure. This map was issued as plate no. 8 in Conrad Malte-Brun's 1843 Precis de la Geographie Universelle.